BRITISH SPACE HERO DAN DARE has been ignored by the mainstream model kit manufacturers. 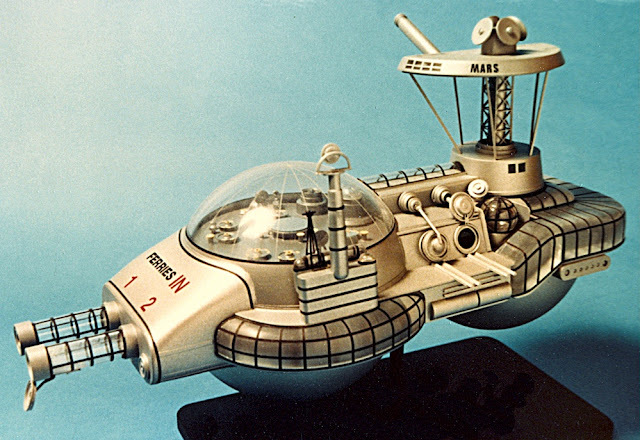 It has been down to individuals like special-effects model maker Martin Bower to produce one-off miniatures of the galaxy of spacecraft that filled author-illustrator Frank Hampson’s universe. SMN report: There have been quite a few attempts to resurrect Dan Dare, the comic book hero that sold so well to schoolboy readers in the 1950s and 1960s. And Martin Bower has been in a position to provide model-making services for two of these attempts. 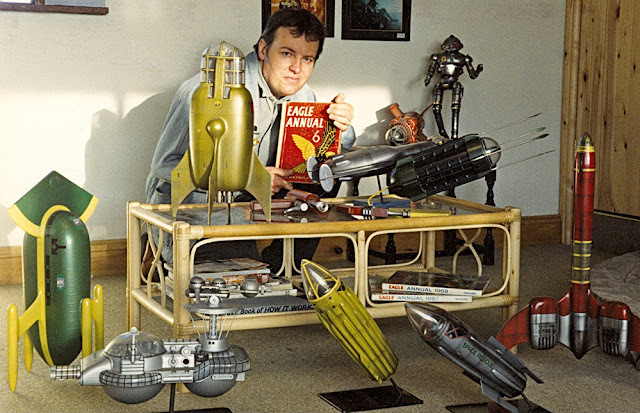 The photo (below) shows him surrounded by a fleet of assorted spacecraft that would make any Dan Dare fan green with envy. In fact, Martin was echoing a procedure that Frank Hampson and his team had perfected many years before, in their art studio. 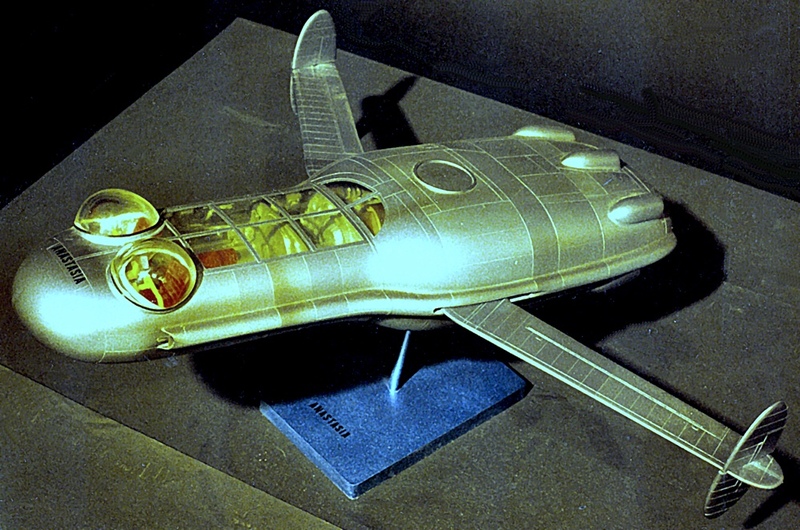 To ensure accuracy, they built models of spacecraft, aliens, and assorted accessories. Photography was important too, as models posed for figure work, to ensure that clothes and uniforms looked right in the final illustrations. 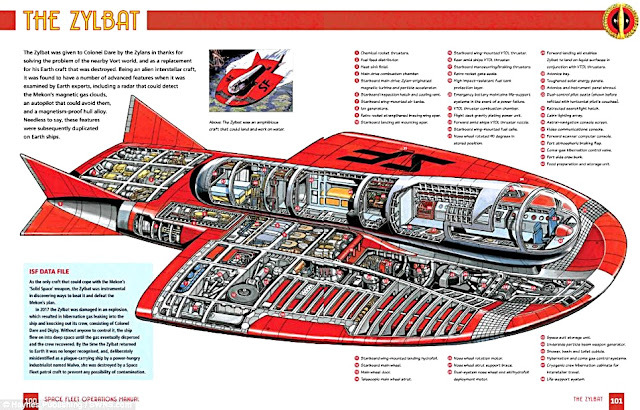 The Pathe News video (below) gives you an excellent look at the creation of the original Dan Dare sci-fi strip. 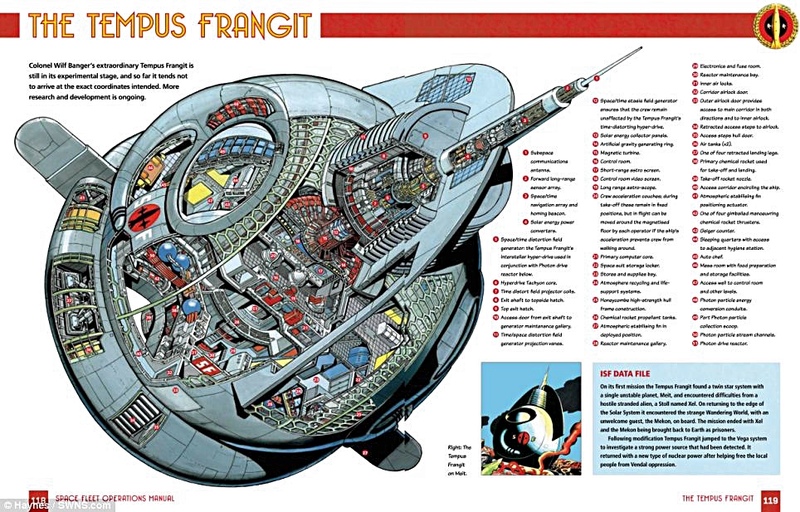 Episodes appeared weekly in the Eagle comic, a publication that appeared in several foreign languages, as well as the English original. 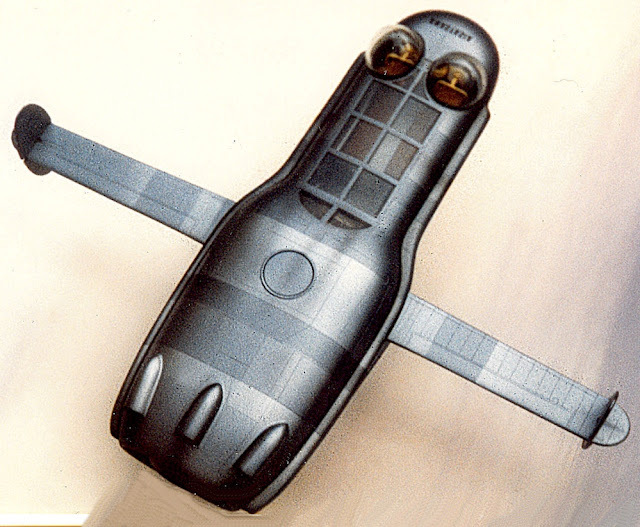 The swing-wing Anastasia (below) was Dan’s personal spacecraft. It was built for him by a grateful Venusian government, after their evil overlord, the Mekon, was removed from power by forces led by Dan and the United Nations of Earth. 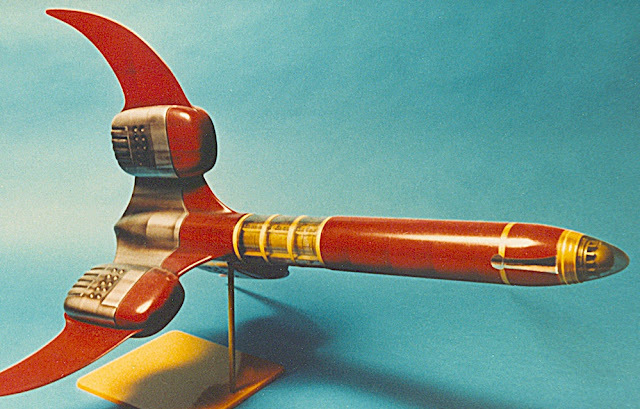 For models like the Anastasia, Martin made individual components from scratch, by taking clear Perspex moulds of the main ships’ hulls and vacuum-forming them over pre-carved wooden blanks of each model. It was much easier to do this, as there were so many clear areas on most of the craft. Making them this way made it far easier for him to mask off windows to get neat, sharp edges, rather than trying to fit precisely-cut plastic into empty window frames. There was nothing standard in this design, or most other Frank Hampson concepts. The twin-dome bubble canopies were a feature of the Anastasia. Behind them was a small living deck under a greenhouse window arrangement, the interior details faithfully reproduced in the model. This shows the use of clear Perspex windows very well. Anastasia could split in two when needed, leaving the front-section to roll freely on a gyro-ball traction system. 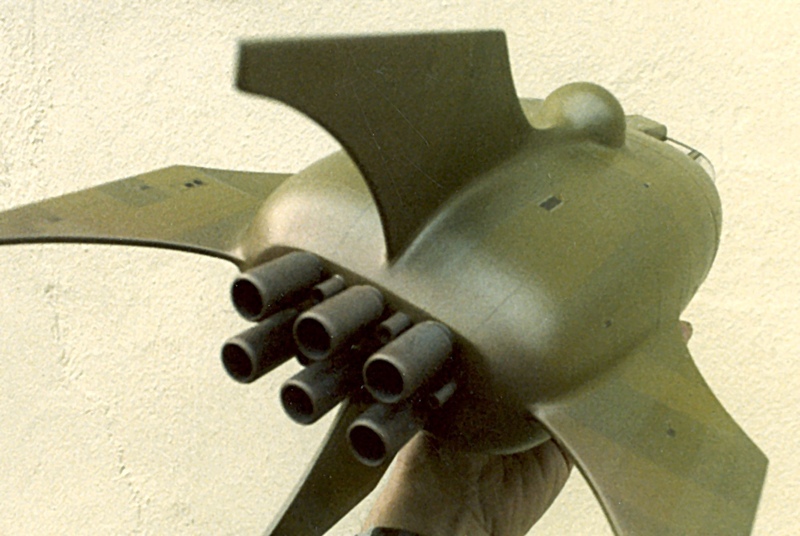 The wings were generally shown extended in atmosphere, folded back when in space. 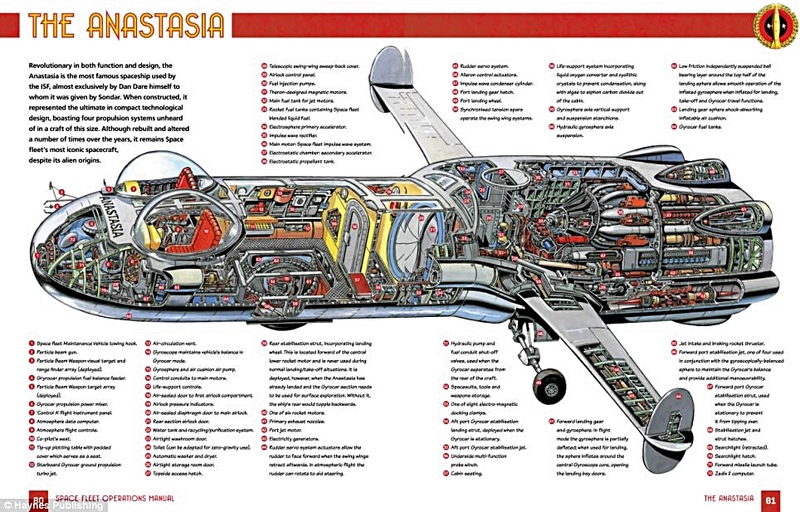 The model has geared wings and tailplanes that move, so Anastasia always has its wings in the line of flight. 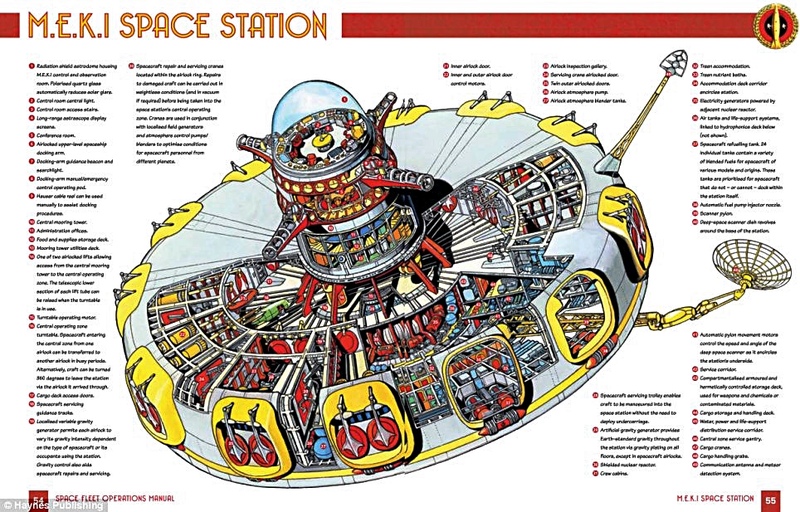 The Mekon’s Telezero ship (above, below) was a death-dealing space weapon. Three of them were designed to link together in orbit, then direct a deadly telezero energy beam at a target. Thousands of dustbin-sized Black Cat drones (below) were sent to conquer Earth by the Saturnian space lord, Vora. Luckily, Dan and his colleagues found their weak link in the nick of time, and our planet was saved. 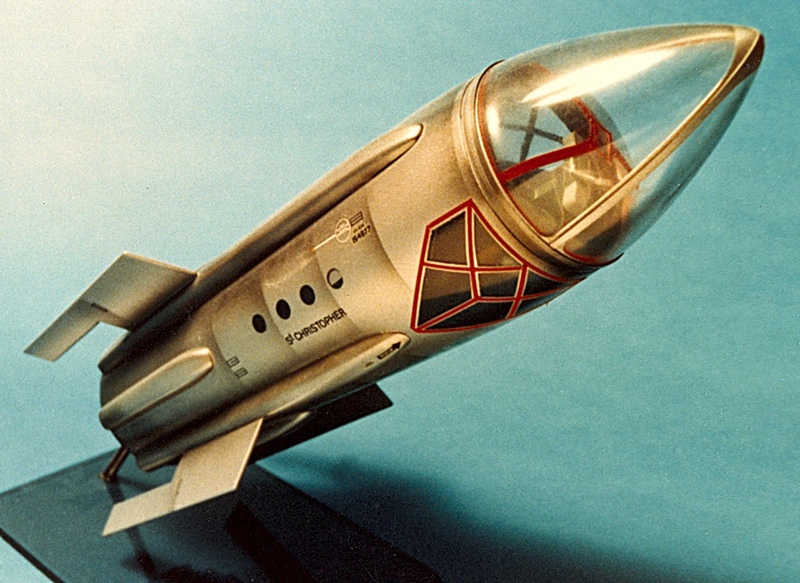 This was one of the simpler Dan Dare models that Martin constructed. 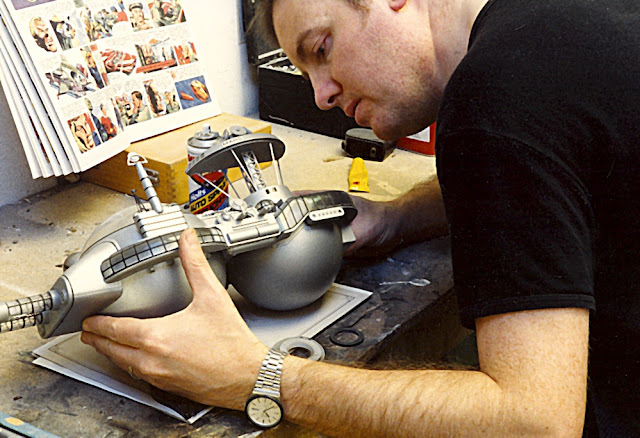 Martin Bower (below) with one of his creations, a scale model of the SFJ2 space station that orbited the planet Mars. 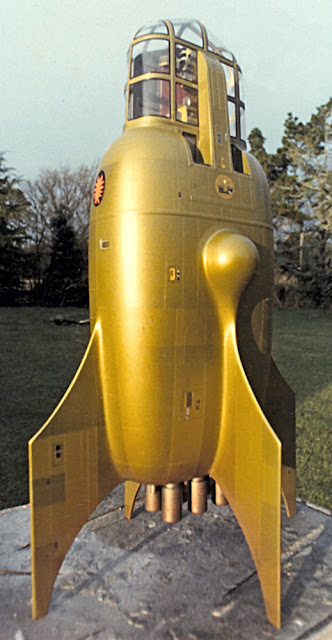 Gravity motors were a technological staple of the Dan Dare universe, so rotation was not needed for the double-bubble design. 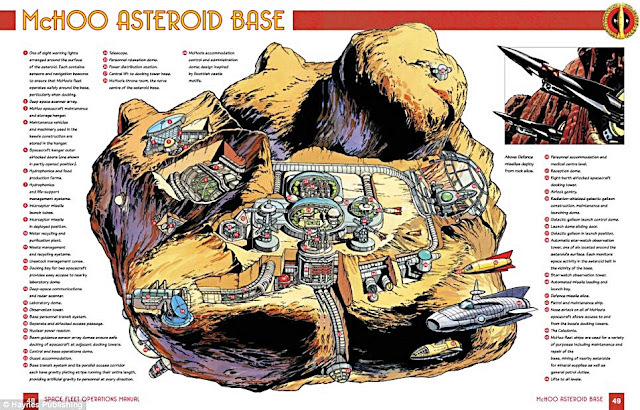 Martin used a range of materials, such as assorted plastics, to create the space station. The large, thick, clear areas were made in solid Perspex, some 38 mm (1.5 in) thick. Unlike the ‘bits-and-pieces’ spacecraft of the Star Wars era, using assorted parts from existing construction kits was not really an option. 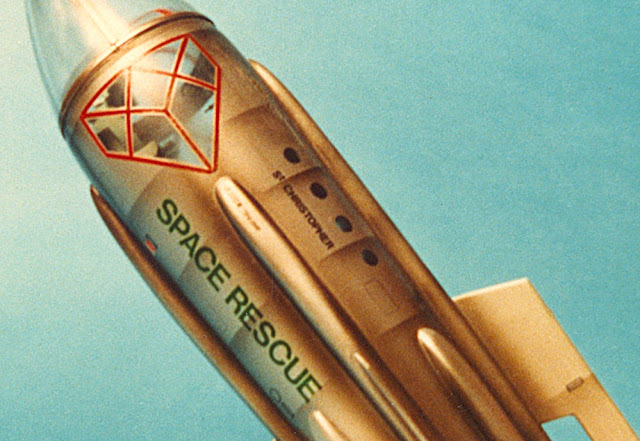 The St Christopher spaceship (above, below) was a rescue craft, built for rapid reaction emergency duties. Note the way Martin used light airbrushing to suggest panel construction detail. 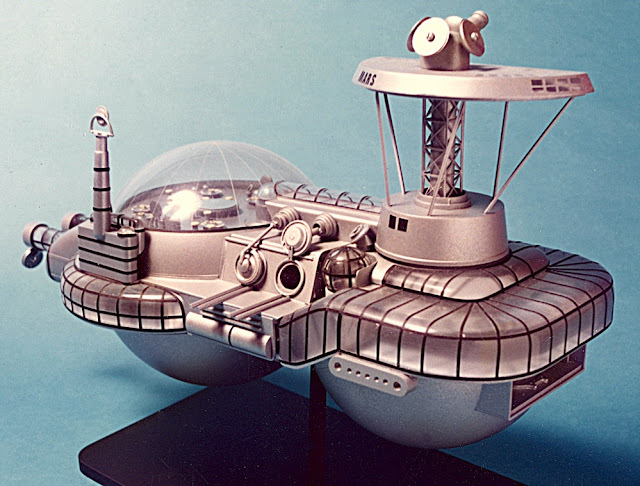 The graceful interstellar craft (below) was flown by Lero and his crew, blue-faced aliens from the distant planet Cryptos. They had flown to Earth to beg for help against the Phants, vicious creatures who were about to enslave the Crypts. Martin used a range of modelling skills to create the spidery craft, including vac-forming some components, and using clear tube for the transparencies. 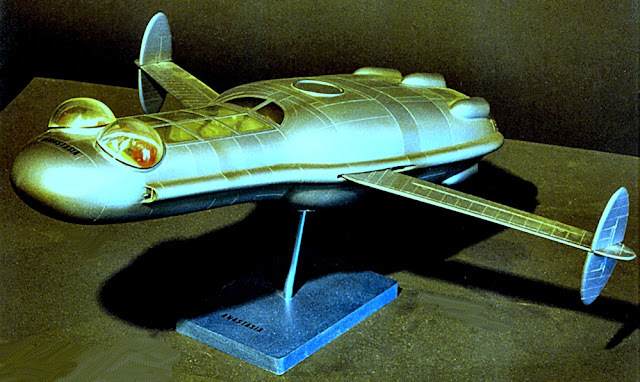 The Dan Dare story Rogue Planet featured the neat Phant spacecraft (below). Martin kept his model faithful to the storyline by giving it a golden-tan spray finish. Rear view of the Phant ship (below) shows the engine nozzles at its aft end. 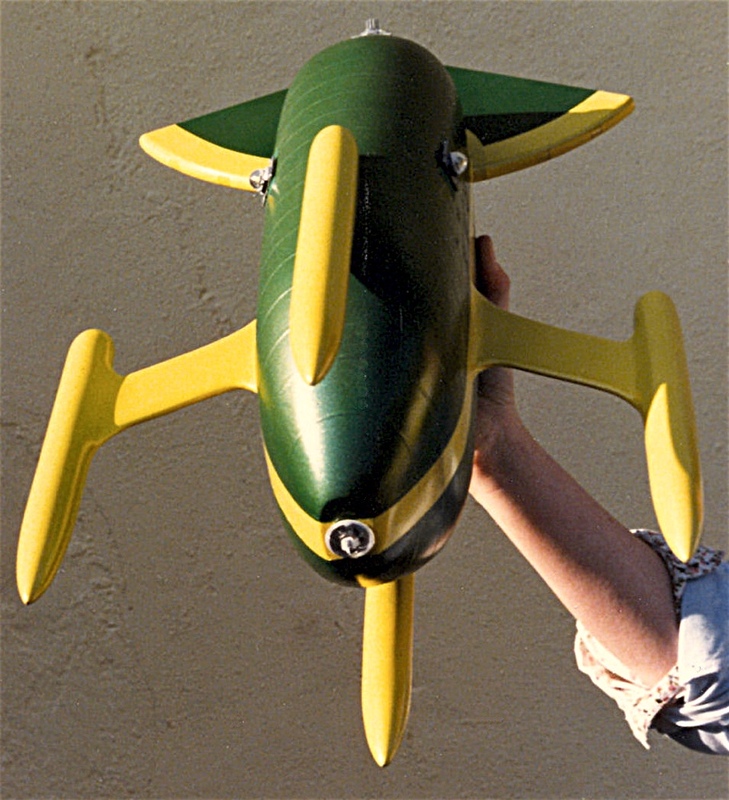 Martin made these using standard plastic tubes of the correct diameter. Thanks to Martin Bower for the information and pictures. Click here to visit his Martin Bower's Model World website. 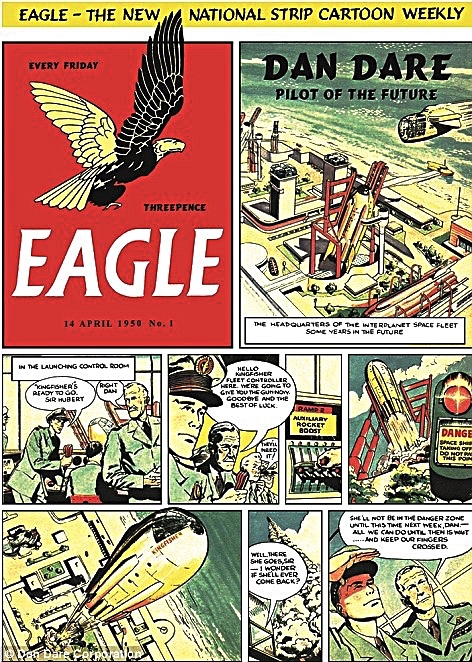 And here's where Dan Dare first appeared, the launch issue of the Eagle (below) dated April 14, 1950. Dan Dare fans might like to buy this detailed book from Haynes Publishing. 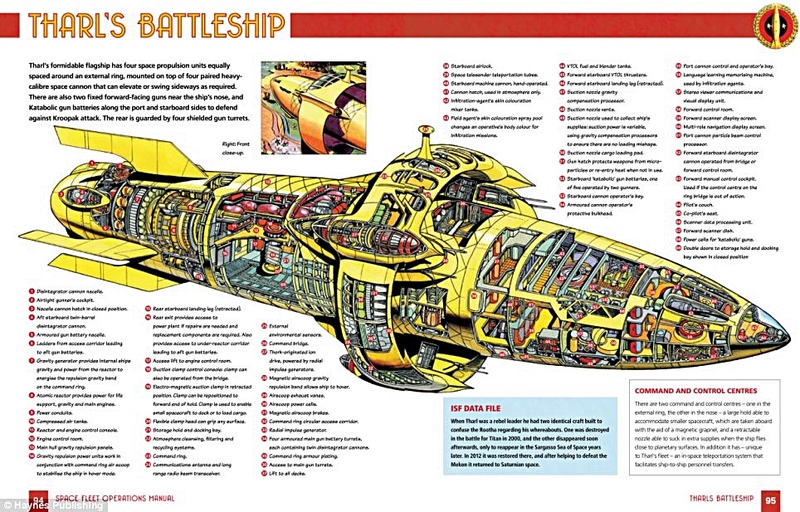 It's packed with an amazing amount of detail, including the truly excellent cutaway drawings (below). 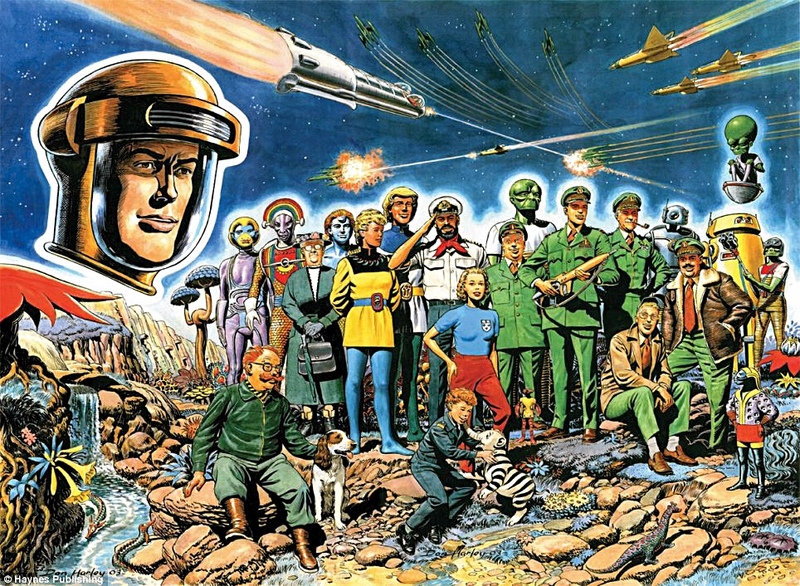 Spaceship Away fan magazine published this who's who of characters in the Dan Dare universe.